Are you looking for a job in a fun software startup environment where you can be part of the core team? Do you enjoy working on the latest web technology and learning the inner-workings of the internet? Do you want to be involved in a cutting-edge Web 2.0 company? If so, Punchbowl is the place for you. We are a highly productive and focused, yet easy-going group of software experts creating a web application for a fun and lucrative market. We're a fast growing company, and have job openings in all functional areas, including software engineering, user interface design, and business development. Tell us how you think your experience and skills can help us grow. We're looking for a range of experience levels in each area, from recent college grads to experienced veterans. If you are interested and are motivated to join a startup, we'd love to hear from you. Want to work at a cool and innovative company without having to commute to Boston? 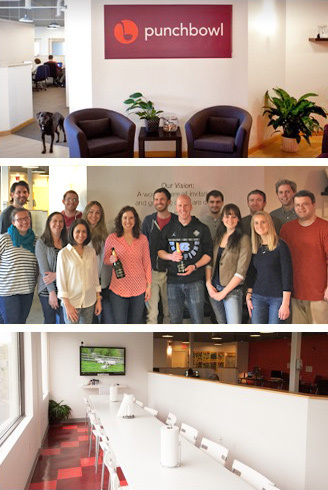 Punchbowl is looking for an Android app developer to join our team in Framingham. This is an exciting time to join Punchbowl: our customer base is shifting to mobile from the web at an unprecedented rate. We’re looking for a developer who has 1-2 years of Android development experience. You believe that user interface details really matter. You care about creating structured and maintainable code, and you consider development your craft. Do you want to work in a growing company that invests in its employees more than the average company? Punchbowl, the gold standard in online invitations, provides a fun, casual, and innovative environment where hard work is recognized and rewarded.